Huge thanks to our event sponsor, Digital Innovation, who are hosting Open Data Camp 2 at their fabulous venue, The Shed. Digital Innovation is a new initiative from Manchester Metropolitan University (MMU) designed to respond to the rapid speed of change in the digital sector. Situated in a refurbished engineering shed on the MMU city centre campus, Digital Innovation brings together start-up businesses, digital research and teaching under the same roof. The DaPaaS project has brought together experts in the fields of linked open data publishing and consumption and the semantic web. Working collaboratively, the project has developed DataGraft; a cloud-based service for data transformation and data access. DataGraft focuses on the needs of data developers, data scientists and data-driven SMEs which require simplified and cost-effective solutions for transforming and managing their data. DataGraft provides hosting services for organisations who might be taking their first steps in publishing data. 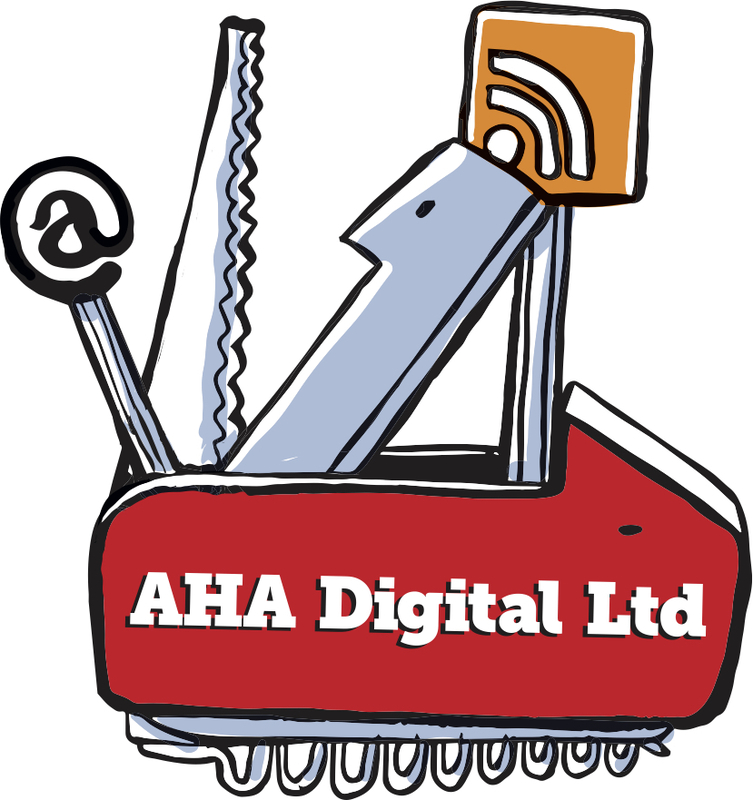 AHA Digital Ltd is a brand new company, created by Open Data Camp co-founder, Mark Braggins. The company logo – the ‘Swiss Army Knife of digital – is an attempt to recognise that there’s no single solution for surviving and thriving in a digital age, and that versatility is key. Open data is used by all sorts of organisations for all sorts of purposes, but it’s still quite tricky to find convincing stories which show open data being used in ‘real life’. One of AHA Digital’s first projects is Open Data Aha! – a not-for-profit experiment to catalog and share open data ‘stories’ from across the world. BlueLightCamp is an annual unconference and open data hack for people who work in-and-around the emergency services. Now in its fifth year, it’s a fantastic networking opportunity, with no pre-defined agenda, and attendees pitching topics they’d like to discuss. Sessions often include the latest thinking on digital, innovation, social media, and open data in a blue light context. The second day brings together people with ideas, service experts, and developers who work together to turn those ideas into something more tangible. NQminds are in IOT and SmartCities. NQM build products from software to hardware for cities to capture, secure and use data to run smarter. In 2014 NQM introduced a secure IOT management platform using sensor technologies all the way up to the cloud that captures, secures and puts data to work. NQM works with complex data problems, and their visualisations and applications using data were recognized by the Cabinet Office as offering best practice. At the first Open Data Camp, in February 2015, Nquiringminds founder and CEO, Dr Nick Allott created GP Pressure Map, which takes account of multiple data sources to forecast pressure points for GP Surgeries in Hampshire over the next 5 years. The Office for National Statistics (ONS) is the UK’s largest independent producer of official statistics and the recognised national statistical institute of the UK. The ONS is committed to releasing as much data as possible under the ‘Open Government License’ and as such is one of the largest providers of [Government] open data in Europe. OpenSensors.io are building a connected world that puts people first. You decide whether to publish your data for all to access with an open data license or keep it for your private use. We have built a scalable real time IoT messaging engine that can easily process millions of messages a second from any internet connected device. We enable you to quickly create real time smart IoT products by giving you the components you need such as real time data access, security, storage, data analytics and machine learning. Use our hosted service or download the service and run it in your own firewall. Ordnance Survey OS is Britain’s mapping agency. We make the most up-to-date and accurate maps of the country. But we’re also a digital business, and we use our content to help governments, companies and individuals be more effective both here and around the world. Swirrl are data publishing specialists: freeing up and linking Open Data so it’s both useful and used. Founded in 2008 by brothers Ric and Bill Roberts, it’s since grown to be a small, brilliant team of creative technologists based in Manchester and Stirling. TigerFish Interactive Drupal development specialists, producers of the Cambridgeshire Insight website for Cambridgeshire County Council as well as their open data site, using the DKAN open data platform are proud to support the Open Data Camp.